FieldTrip is the MATLAB software toolbox for MEG, EEG, iEEG and NIRS analysis. It offers preprocessing and advanced analysis methods, such as time-frequency analysis, source reconstruction using dipoles, distributed sources and beamformers and non-parametric statistical testing. It supports the data formats of all major MEG systems and of the most popular EEG, iEEG and NIRS systems. New data formats can be added easily. FieldTrip contains high-level functions that you can use to construct your own analysis protocols as a MATLAB script. Please cite the FieldTrip reference paper when you have used FieldTrip in your study. Robert Oostenveld, Pascal Fries, Eric Maris, and Jan-Mathijs Schoffelen. FieldTrip: Open Source Software for Advanced Analysis of MEG, EEG, and Invasive Electrophysiological Data. Computational Intelligence and Neuroscience, vol. 2011, Article ID 156869, 9 pages, 2011. doi:10.1155/2011/156869. Jan-Mathijs and Robert have just published a paper in Scientific data, which is a Data Descriptor of our MOUS dataset, a 204-subject multimodal neuroimaging dataset collected by MPI and DCCN researchers, which is now shared with the wider research community at our Donders data repository. The data are organized according to BIDS. Go and check it out! We just completed the first ECoG/SEEG toolkit at the UC Davis Medical Center in Sacramento, California. The three-day event was packed with lectures, hands-on sessions, and fruitful discussions, with people visiting from all over the US (and beyond). Many thanks also to neurosurgeon Fady Girgis and neuroscientist Bob Knight for providing lectures on the clinical aspects and research applications of intracranial EEG. We plan to upload videos of the lectures, so stay tuned. Check it out! Matthias Treder has kindly contributed a tutorial and some code (streamlined a bit by yours truly) that now allows you to perform MVPA analysis in FieldTrip, using his awesome MVPA-light toolbox ! For now it is well supported, documented and tested for channel level time domain data, but in the near future (and with your help) we will also ensure support for frequency domain and source level data. For now you can just use ft_timelockstatistics with cfg.method=’mvpa’. The tutorial can be found here. All the best wishes for the new year to all of you on behalf of the FieldTrip team! According to Google Scholar, the FieldTrip paper has now been cited more than 3000 times. We are happy that the project provides so many of you with helpful tools that facilitate you to contribute to the scientific community. 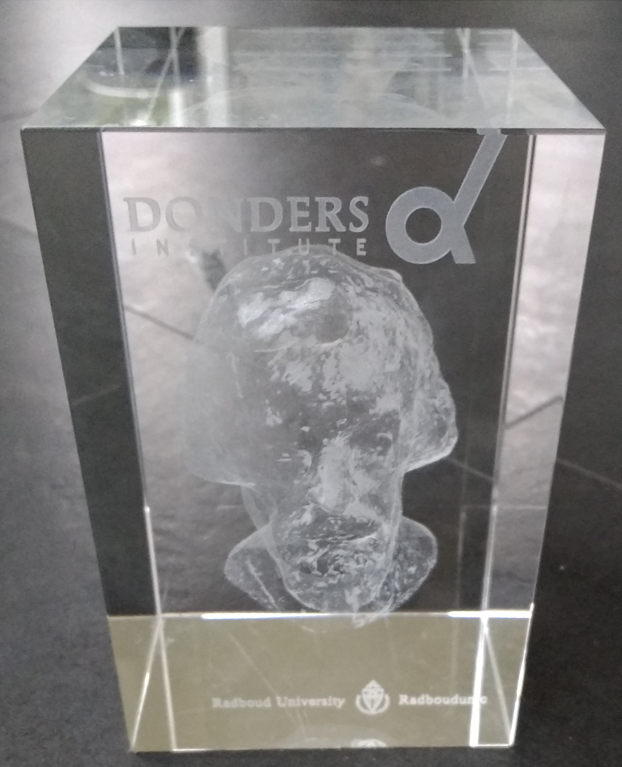 Today we had our end-of-year poster session at the Donders Institute, during which also the Donders Cube has been awarded. This is an institutional award that acknowledges ‘beyond-call-of-duty’ contributions to the scientific and social life of the Donders Institute, and beyond. We are pleased that this year’s award has been awarded to the FieldTrip team! We are proud to be able to work on such a nice project, which wouldn’t be in its present shape if it weren’t from the interactions with and contributions from the whole FieldTrip community! So, let’s keep up the good work for the new year to come, and for now all the best for the holiday season. We have completed the move to the new website which you are now seeing. See this message on the mailing list for details. The old website is still available in case you want to look up something there. If you want to edit any page on this website, please click the “Edit this page on GitHub” link at the bottom of each page. This brings you to github where you can click the “pen” symbol in the upper right corner. Or have a look at our git and github tutorial.